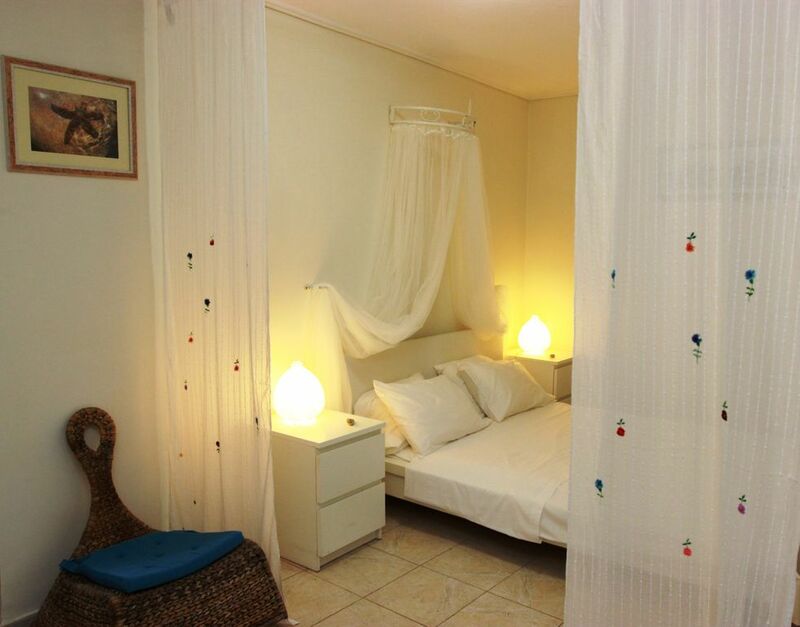 Our spacious 65 sqm studio is situated in the hamlet of Apergatika, 1.2 km away to Lakka. Open plan studio design with double bed, fully equipped kitchen, open plan sitting/dining area, large shower room, TV, DVD, Wifi , AC, complimented by a shared swimming pool and outdoor patio area.The studio is equipped to take up to 4 people and the sleeping arrangements comprise of one double bed and one double sofa bed. There are outdoor sitting areas on balcony & rear of property with distant sea views. A cot can be supplied on request. The studio can be rented individually or can be combined with Orkos Studio to make a larger split level apartment that can accommodate up to 8 people. This is made possible by utilising the internal staircase between the two studios which is normally kept locked if they are being utilised separately. Just a short 15 min walk will take you to two of Paxos's best, yet least known, beaches of Orkos and Lakkos. The village of Lakka is just a leisurely stroll away and there you will find all the facilities you will need to enhance your stay (10 minutes walking distance to Lakka or just 3 min in a car). Loggos 5 mins drive, Gaios 15 mins. With its bustling waterfront with many bars & tavernas its easy to miss the other outstanding tavernas & bars in the quaint little backstreets of the Lakka village. Daily bus service to Loggos & Gaios removes the need for a hire car, although these can be easily obtained should you wish to be more independent. By far the best way of seeing Paxos is by renting a small motor boat for the day & exploring the dramatic west coast & the stunning Antipaxos white sandy beaches. Guests have access to the whole studio exclusively & private.